What exactly does the title of Atlas Shrugged mean? I remember the quote in the book went something like “Do you know what I would say to Atlas? I’d tell him to shrug.” But I’m unclear on what it literally means. Does it mean to make a gesture that says “Uh whatever” as if you don’t care, or does it mean to stop bearing the weight of the world and just let it drop? “Atlas Shrugged” is a direct reference to the central philosophical lesson of the novel: that one should not sanction one’s own victimhood. See “The Sanction of the Victim“. 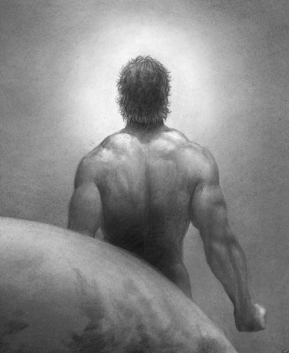 The mythical Greek god Atlas held the world on his shoulders. * In the novel, the weight of the world is the necessity of thinking. It is the need to think in order to produce and earn the physical and spiritual values upon which one’s survival, and the achievement of one’s happiness, depend. Those who, in the novel, are society’s thinkers and producers are society’s (and the novel’s) Atlases (aka the male and female “Men of the Mind”). Over the course of the novel, those who refuse to do the thinking – the heavy lifting – needed to produce those values instead attempt to obtain those values by, in essence, mooching from and looting the thinkers and producers. Over time, a greater and greater number of government regulations are imposed to require the thinkers to continue thinking and producing while the fruits of their labours are given to those who do not think and produce: the novel’s villains. The central lesson for the novel’s Atlases – the truth that they must discover – is that although one’s body can be put in shackles, it is impossible to force a person to think. Therefore, every Atlas has the power not to be enslaved; the inalienable freedom not to think for looters and moochers; the freedom not to produce that which depends upon their thinking; the freedom to go on strike. The novel’s Atlases must learn that, if they do not go on strike – if they do not temporarily shrug off the necessity of thinking – the looters and moochers eventually will cause the suffering or death of the Atlases (and of everyone else, as a result). Because one’s own life is one’s highest value, it is not only possible but also morally right for an Atlas to go on strike, and a vicious act of murder-suicide not to do so. “Atlas Shrugged”, therefore, is a reference to what ultimately happens in the book. Atlases temporarily shrugged-off the weight of the world, demonstrating to all that slavery and theft depends upon the consent of its victims and is therefore ineffective as against a society of virtuous and righteous individuals; that one must think and do for oneself; that there’s no such thing as a free lunch. *More precisely, he was charged with keeping earth and the heavens apart. It matters not whether he pushed at the heavens with his feet, or with his hands. Hence the numerous statues and drawings/paintings in which he is carrying earth on his shoulders: in those cases, his feet are pressing against the heavens.